Following our activation of VK5/ SE-006, Ian and I got back to the car, only to find that Ian had left the lunches at home. Bugger ! We were both that hungry that we could have eaten a low flying duck. Our afternoon summit, Mount Bryan, VK5/ SE-001, was going to be a two hour climb, so we were in need for some tucker. So we travelled south on the Barrier Highway, and headed into the nearby town of Hallett, only to find that the local Servwell store, come take away was closed on Sundays. 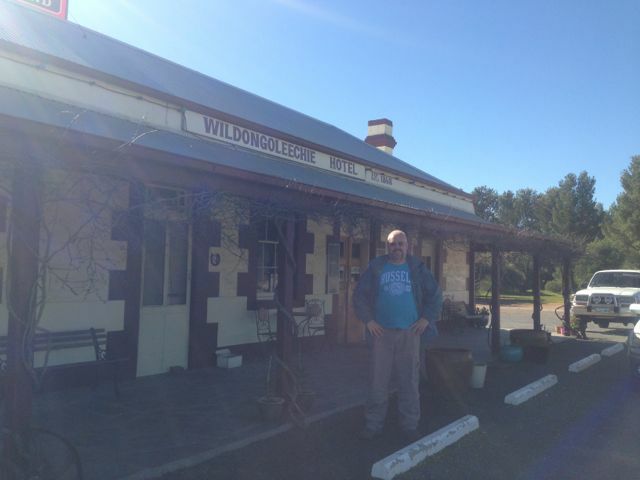 After some cursing & swearing, we headed to the local pub, the Wildongoleechie Hotel. 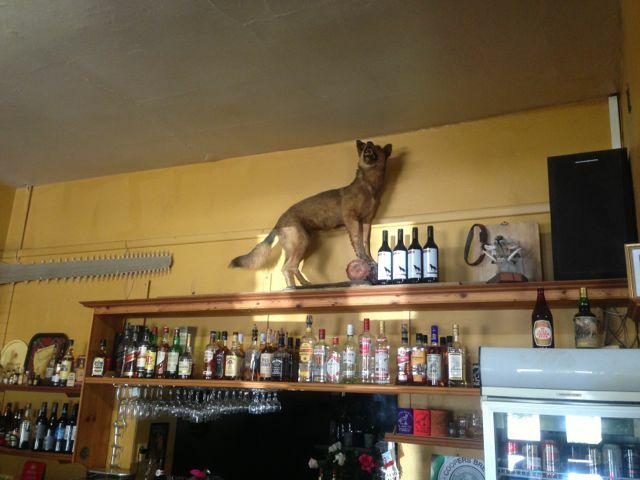 What a great pub. Not only did we pick up a meal & a couple of nice cold beers, but we got some directions from the licence on a short cut to reach the northern side of Mount Bryan. So with some local tips it cut down our 2 hour climb to a possible 20 minute climb. The new owners of this pub have only been here from Western Australia for the past 6 months, and they are making a go of it. They were very friendly, and if you are ever out this way, it is a terrific little country pub with a great atmosphere. It is a very historic pub, and was established way back in 1868. There are conflicting stories about what the name means. Hallett is a small town in the Mid North of South Australia, situated about 220 kms north of Adelaide. 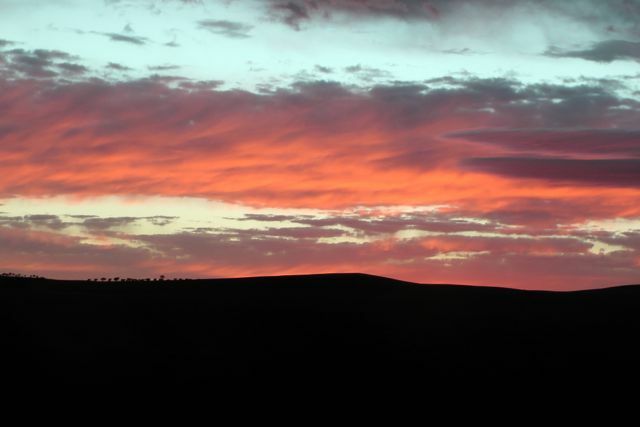 It is about 32 kms north of Burra and about 38 kms south east of Jamestown. 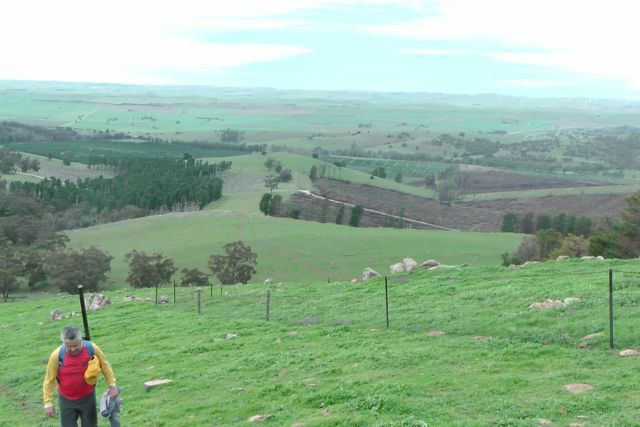 It lies very close to Goyder’s Line, which was plotted in the 1800’s by George Goyder, separating the land suitable for cropping from the land suitable for grazing. Hallett has a population of about 210 people. It was once a railhead for the local farming community. Hallett is the closest town to Mount Bryan East, which is the birthplace of Sir Hubert Wilkins (1883-1958), a polar explorer, ornithologist, pilot, soldier, geographer and photographer. He was perhaps the last modern explorer in Australian history. 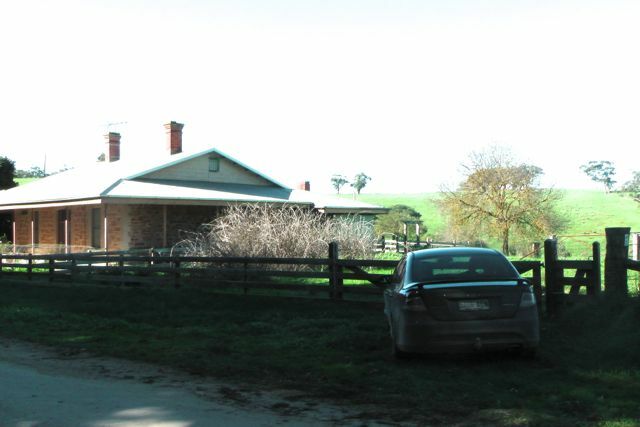 Sir Hubert Wilkins birthplace and childhood home, Netfield, now restored as a historic site, is easily accessible from the renowned Mount Dare Driving Circuit between Hallett and Terowie. After lunch we travelled north out of Hallett on the Barrier Highway and then turned right onto Mount Bryan East Road and travelled north east. We then turned right through a double farmers gate about 5 kms along Mount Bryan East Road. There is a sign on the gate warning about the removal of wood. We followed this dirt track, travelling north, and through a few more farmers gates. 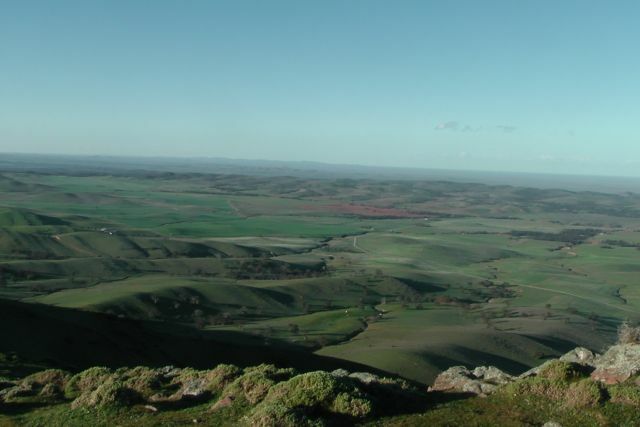 Mount Bryan is the highest peak in the ‘South East’ region for Summits on the Air in South Australia. It is 933 metres above sea level and is worth 8 points. It is situated about 5 kms east of Hallett, and about 18 kms north east of the township of Mount Bryan. The weekend prior to our activation, there was snow all over Mount Bryan and the surrounding peaks. 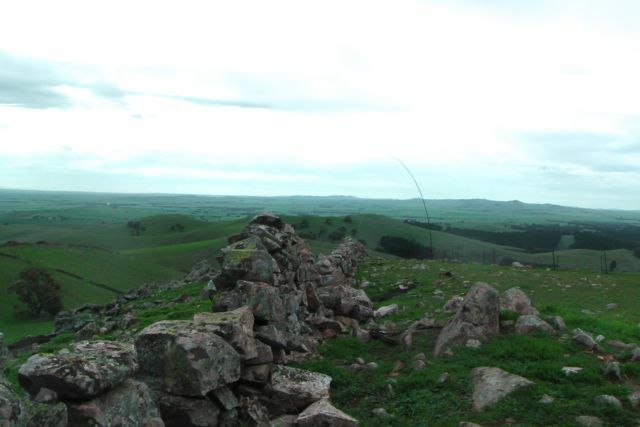 The summit was first sighted by Edward John Eyre and his Party, who were the first Europeans to explore the area west of Hallett on a trek to the northern areas of South Australia in July, 1839. The town of Mount Bryan was named by the Governor of South Australia, Lt. Col. George Gawler, after the nearby peak. 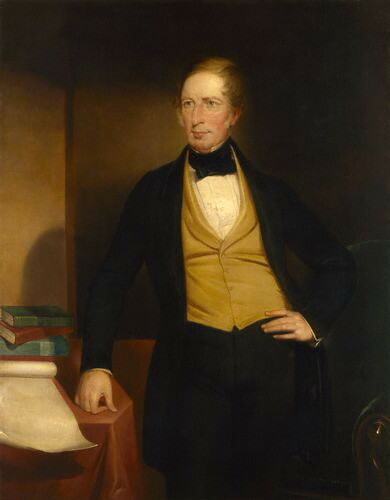 He named it in honour of Henry Bryan, a young man who became lost and presumably perished of thirst during Gawler’s ‘Goolwa to Nor-West Bend expedition’ in December, 1839, which was to ‘examine the land along the Murray River, with the hope of finding fertile country; and also to determine the capabilities of river and lake for inland navigation‘. 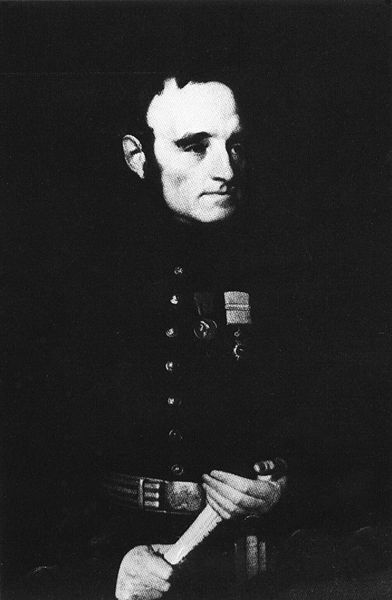 Among those accompanying Gawler was Gawler’s aid, John Craig, the famous explorer Charles Sturt and the Chief of Police Henry Inman. Apparently a number of rash decisions plagued this expedition, which was otherwise notable for including ladies with a view of dispelling fear of the natives by settlers to the new colony. This included Charlotte Sturt who was Captain Sturt’s wife; Beatrix Sturt, who was Captain Charles Sturt’s biographer and his daughter in law; and also Julia, the daughter of Gov. Gawler. 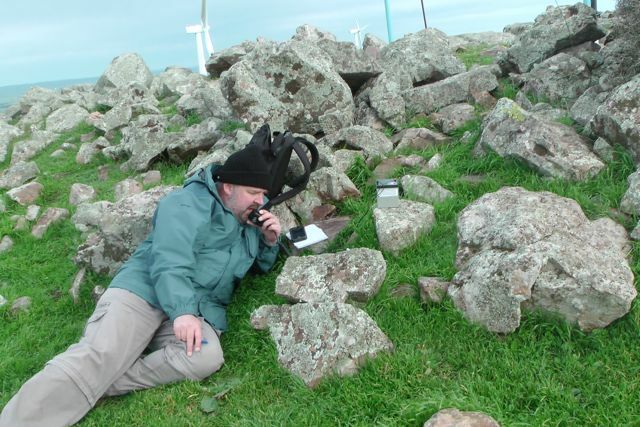 The story of this expedition is truly remarkable, and whilst I sat on the top of Mt Bryan using technology like an amateur radio transceiver, I shut my eyes to imagine what it must have been like 174 years ago. Beatrice Sturt wrote:- “A second careful search at this spot disclosed the tree to which he had tethered his horse. 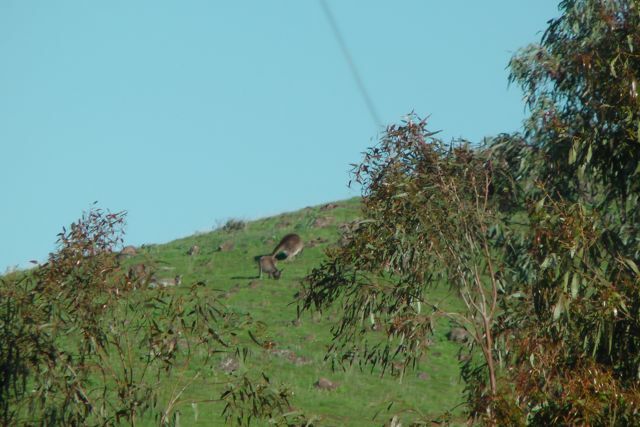 The animal on escaping had taken a course due west to the hills with his rope trailing after him, and he eventually found his way back to Adelaide. But not search could disclose even to a native’s piercing eye any footprint or other mark in the direction indicated. Repeated efforts were made; they examined every bush, fired at intervals, constantly shouted; but to no purpose, nor was any further trace of ‘Bryan’ ever found”. The town of Mount Bryan was once a busy hub of rail transport where up to 44 trains every week rolled to a halt. Shunting lines to the cattle and sheep yards, a cream and egg shed, a cloakroom, goods sheds, the Station Master’s Office and wheat stack yard filled the area around Mount Bryan. There was a daily passenger service to Adelaide, and the railway provided fresh fruit and vegetables, mail, and health services to the district. Passenger services operated from 1880 right up until 1988. Today Mount Bryan township is a sleepy hollow, with a population of about 140 people. It was once the heart of a thriving farming community, including some of Australia’s best known Merino sheep studs. 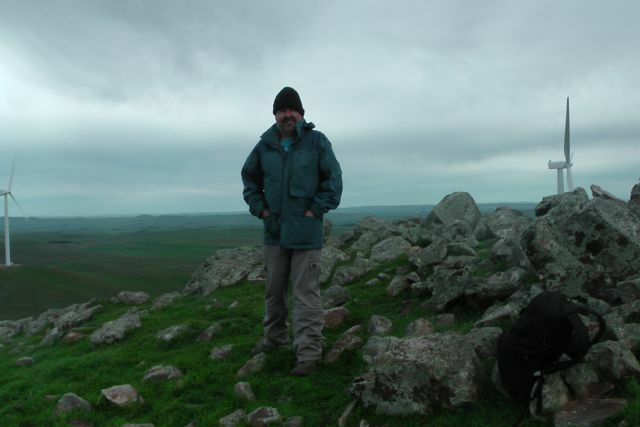 Ian and I parked the car about 1 km from the summit and climbed up a steep side of the hill to reach the trig point. It was a beautiful sunny day but blowing an absolute gale. There is the remnants of a trig point at the top. It consists of three blue metal poles. Nearby is a concrete/besser block chair which faces the east. A bit cold on the backside, but an amazing view to the east from the comfort of the chair. 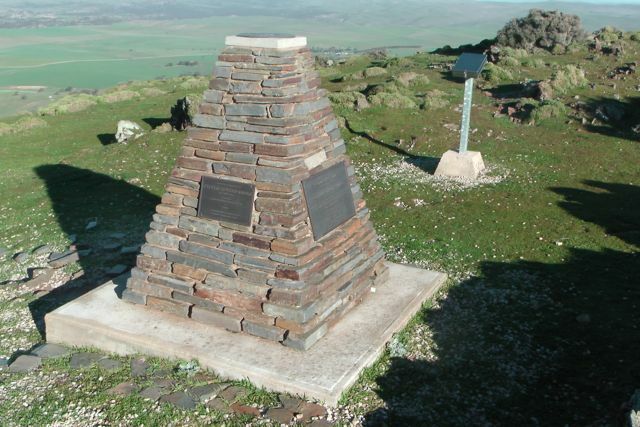 There is also a memorial cairn at the top of the summit, which was erected in 2002 by Mr. Glen Tiver, whose forebears owned the property ‘Rupera’ which encompassed Mount Bryan and its environs. It contains four commeorative plaques in memory of Edward John Eyre, Gawler Sturt & Bryan, Edward Frome, and three generations of the Tiver family. Sadly, this was not the original cairn on the summit. In 1842, Colonial Surveyor, Lieutenant Edward Frome erected a cairn on the site, during his further explorations of the area. 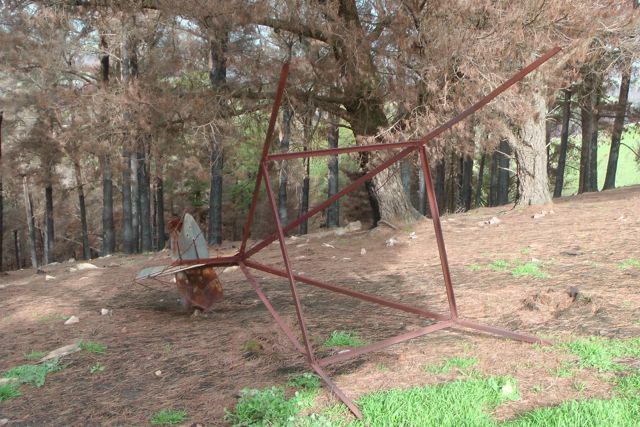 Following Mount Bryan being acquired as a Government Water Reserve in 1970, the S.A. Water Authority demolished Frome’s historic cairn to make way for other engineering works. What a disgrace ! There are also a number of towers with various radio repeaters, etc. Fortunately they did not create any interference and the noise floor was virtually undetectable. There is also a visitors book which we signed. Going from the experience the day before with the squid pole snapping twice, we knew that today’s winds were just as bad as yesterday morning’s winds, so we looked around carefully for an operating spot. We walked down to a little gully just down from the trig point and this seemed to afford quite a bit of protection from the very strong winds. 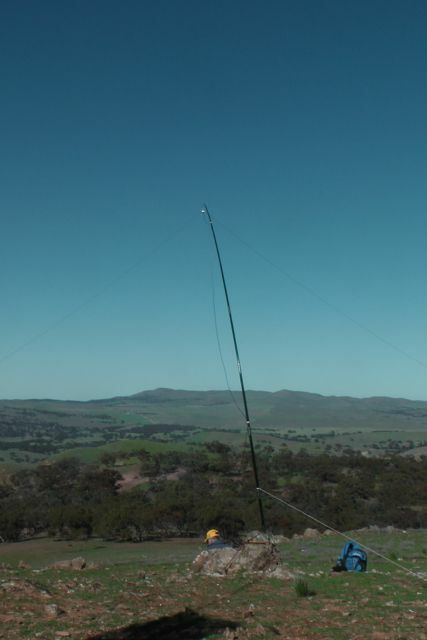 We set up the squid pole, attaching it to a Heysen trail sign post, using the octopus straps, and we then attached the 40m/20m linked dipole, weighing down the ends with some rocks. The wind was so strong that the legs of the dipole went flying into the air on at least two occasions. My first contact of the afternoon was with Col VK5HCF who was using just 5 watts QRP. Col had a terrific 5/8 signal. 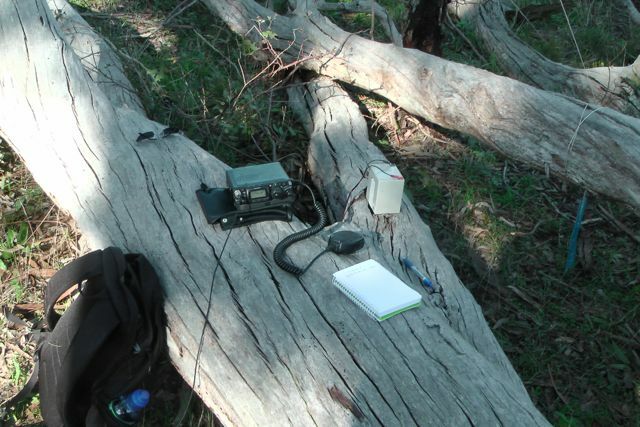 My next QSO was with John VK5BJE who was portable in the Ramco Point Conservation Park in South Australia’s riverland. 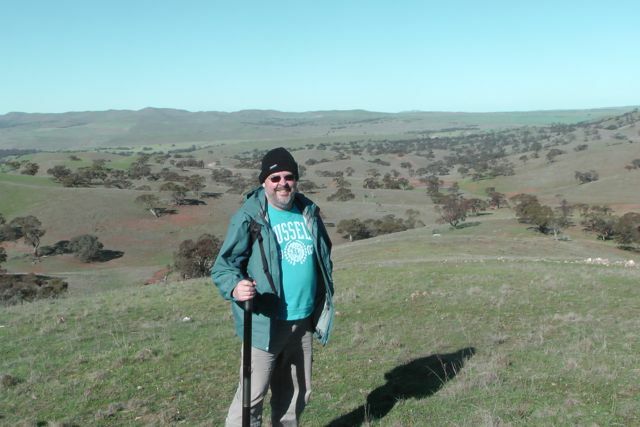 John was activating quite a few Conservation parks as part of the VK5 National &amp; Conservation Parks Award. John was also QRP and he too had a great 5/8 signal. Next was Ernie VK3DET, followed by Peter VK3PF to make my 4 required QSO’s. Ian had already activated this park earlier in the year, so for him it was not worth any additional points. However whilst I got up to stretch the legs and go for a walk, Ian jumped onto 20m SSB and made 5 contacts into Europe, VK2, &amp; VK6. The views from the top of the summit are really quite something. There are 360 degree panoramic views. After an hour of activating, it was time to get off the summit. Before leaving we bumped into the bushwalker whose car we had seen parked down at the base of the summit. He was a friendly guy and we explained why we were up the top of Mount Bryan and he was very interested. On the way back to the car we saw a large number of kangaroos. 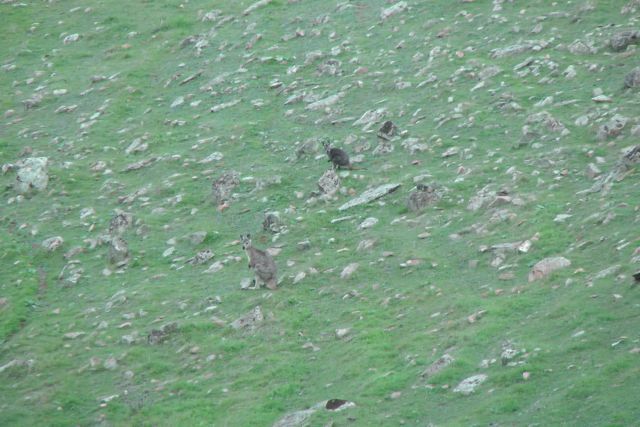 It was getting on towards 4.00 p.m. and they were just starting to come out and graze on some of the lush greenery on the hills. It was an enjoyable hour or so on the hill, with a total of 26 QSO’s on 40m SSB into VK1, VK2, VK3, VK4, & VK5, and 2 QSO’s on 20m SSB into Spain & New Zealand. I worked the following stations:- Col VK5HCF/qrp; John VK5BJE/p/qrp; Ernie VK3DET; Peter VK3PF; Peter VK3ZPF; Andy VK5LA; Tony VK3CAT; Brian VK5FMID; Rhett VK3GHZ; Tom VK5EE; VK2LAX/p; VK5PEP; Peter VK3FPSR/m VK2; Nick VK3ANL; Brian VK3MCD/p; VK3OHM; Paul VK4CPS; Ron VK3AFW; Roy VK5NRG/qrp; Mal VK3AZZ; VK4FADI; Shaun VK5FAKV; Andrew VK2UH; David VK5NQP; Mark VK1MDC; VK4FBRI/p/qrp; John EA7BA; and Brian ZL2ASH. I have posted a video of this activation on You Tube. On Sunday morning, 28th July, 2013, Ian and I had another early start. Wide awake and out of bed at 5.30 a.m. for another one of Ian’s fine cooked breakfast consisting of eggs and bacon and fresh home made bread. It had been raining overnight, despite the weather forecast saying that today was mean’t to be sunny. So we headed out, travelling north to un-named summit, VK5/ SE-006. The weather did not look good, and the rain was quite heavy. But we did have some hope, because as we looked to the north east the skies were clear. As it turned out the rain cleared and there was a spectacular sunrise. We travelled north along the Barrier Highway, through the little town of Mount Bryan, and then passed the imposing Mount Bryan summit, which is South Australia’s third highest peak. Mount Bryan was to be our afternoon activation. The VK5/ SE-006 summit is situated about 10 kms west of the little town of Whyte Yarcowie on the barrier Highway. Access to the summit is via private property. Whyte Yarcowie was surveyed in 1875 and the name Yarcowie is said to be aboriginal for ‘wide water”. “Whyte” was added to the name in 1929, after an early pastoralist John Whyte. Alexander McCulloch was the first to pioneer the area and his name is given to McCulloch Square. The railway station was built in 1880 and Whyte Yarcowie was a good example of a bustling railway town in the early 1900s. The town had a flour mill, schools, hotels and an Anglican Church which, at the time, was reported to be the smallest in Australia. After a 45 minute climb, Ian and I reached the summit and set up our gear in 2 different spots. Ian was using his Elecraft KX3, 5 watts output and a 40m/20m linked dipole supported on a 7m squid pole. I was using a Yaesu FT-817nd, also 5 watts output, and also a 40m/20m linked dipole supported on a 7m squid pole. It was a beautiful day on the top of the summit with bright sunshine but a very strong westerly wind. 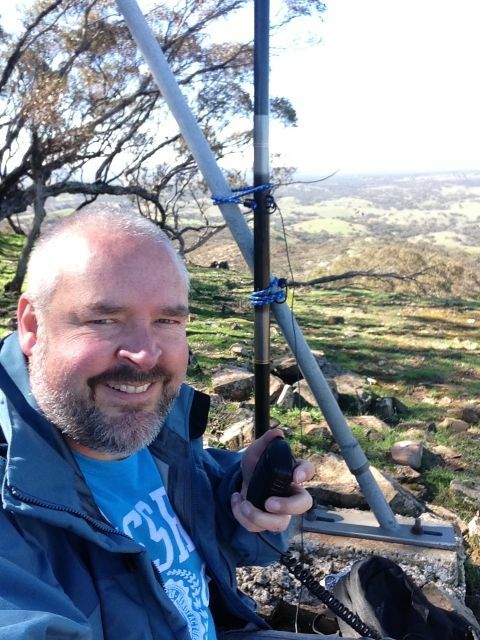 My first QSO of the morning was a Summit to Summit contact with Mike VK3XL who was portable on Mount Johnston, VK3/ VG-122 (5/6 both ways). Dave VK3VCE then called in, followed by Peter VK3PF. 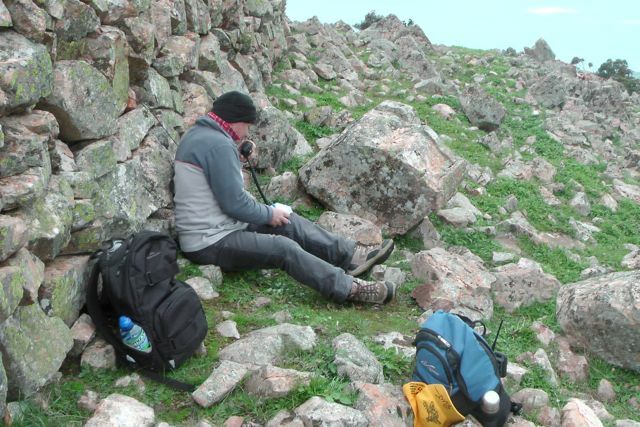 My fourth contact was also a Summit to Summit QSO with Phil VK3BHR who was portable on Mount Kooyoora, VK3/ VU-007. This was followed by the regular crowd of Chasers, all of whom ahd very good signals. Again I had a few enjoyable QRP contacts with Urey VK3ATA, Rik VK3KAN/p using just 3 watts, Peter VK3ZPF, & John VK3XR/m using just 10 watts. All had very good signals. And I also spoke with John VK5BJE who was operating portable again. This time in the Maize Island Conservation Park as part of the VK5 National & Conservation Parks Award. John had been really active the past few days in the Riverland, activating parks as part of the Award. Well done John. Always a great signal. I managed 35 QSO’s on 40m SSB into VK1, VK2, VK3, VK5, & VK7, including two Summit to Summit QSO’s, and one VK5 Parks Award contact. Mike VK3XL/p (SOTA); Dave VK3VCE; Peter VK3PF; Phil VK3BHR/p (SOTA); Larry VK5LY; Col VK5HCF; Nev VK5WG; Andy VK5LA; Rhett VK3GHZ; Tom VK5EE; VK3OHM; Ernie VK3DET; Mark VK1MDC; Ron VK3AFW/m; Andrew VK2UH; Roy VK5NRG; Urey VK3ATA/qrp; Tony VK3CAT/p; Tom VK2KF/qrp; Brian VK5FMID; Brian VK3MCD; Shaun VK5FAKV; Rik VK3KAN/p; Peter VK3ZPF/qrp; John VK3XR/m/qrp; John VK5BJE/p/qrp; Ron VK3AFW; Peter VK2NEO; Ed VK2JI; David VK3EW; Graham VK5KGP; Ken VK3ALA; Al VK7AN; Scott VK7NWT; and Ken VK3XYC. Time to head down and off to the next summit. The big climb at Mount Bryan. I have posted a video on You Tube of the activation. 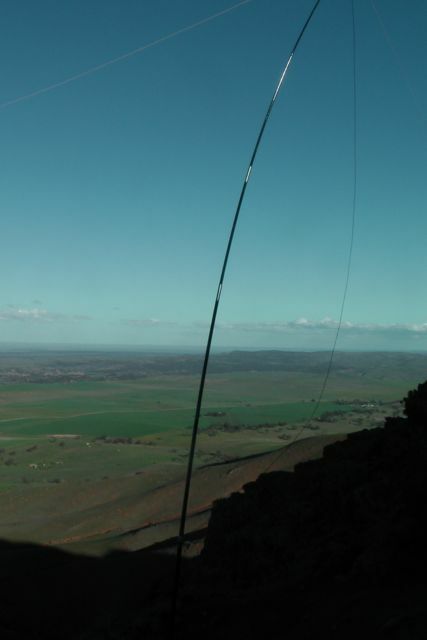 Our second activation of the day was New Campbell Hill, VK5/ SE-007. Ian had already activated this hill, but that was last year in 2012, so it was some more Activator points for him as well. We had about a 60 km drive to the north west to get to New Campbell Hill from Hallett Hill. We cut across to the west to Spalding and then travelled north up the RM Williams Way. RM Williams Way is named after Reginald Murray Williams, AO, CMG (born in 1908 – died in 2003), who was an Australian bushman and entrepreneur who rose from a swagman to a millionaire. He was widely known as just ‘R.M.’, and was born at Belalie North near Jamestown. He became known for creating an Australian style of bushwear recognised world wide. New Campbell Hill is situated close to the Bundaleer Forrest Reserve in South Australia’s mid-north, to the south of the township of Jamestown. It is about 220 kms north of Adelaide. The hill is 714 metres above sea level and is worth 4 points. Bundaleer Forest was Australia’s first plantation forest. 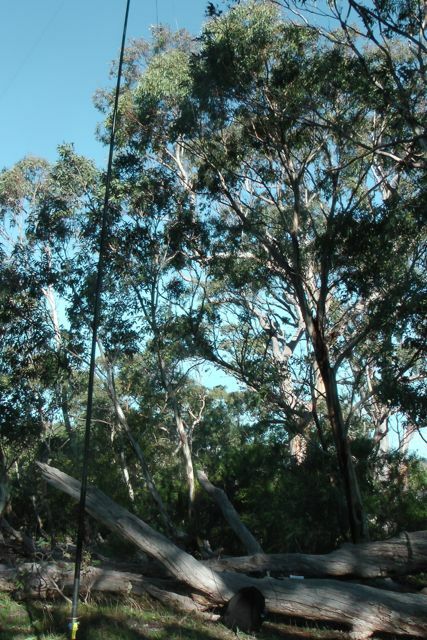 The forest is the birthplace of the Australian forest industry. It is just 10 kilometres south of Jamestown, and offers magnificent scenery and walks. The Heysen trail (for hikers) and Mawson trail (for mountain bikers) take in the Bundaleer Forest. The Arboretum on Georgetown Road contains a range of native and exotic tree species. The Conservator’s Hut – formerly the exclusive residence of the Conservator of Forests – is on the Conservator’s Trail. Picnics can be enjoyed in the picnic grounds all year round, except for days of extreme fire danger. 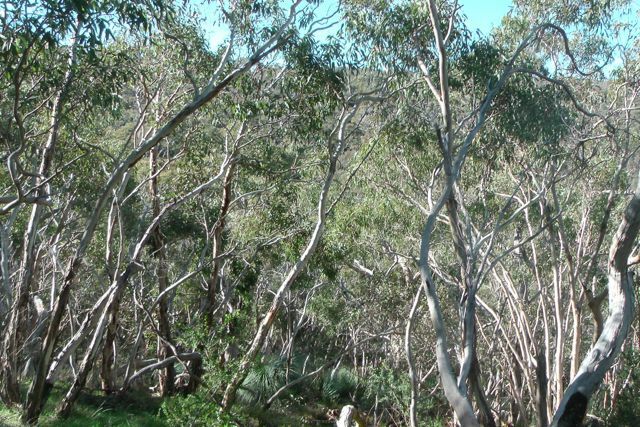 By the 1870’s, much of South Australia’s native trees had been wiped out by eager pioneers in their rush to find materials for buildings, railway sleepers, jetty pylons and supports for mining shafts and tunnels. The need to find a suitable forestry timber species was crucial. 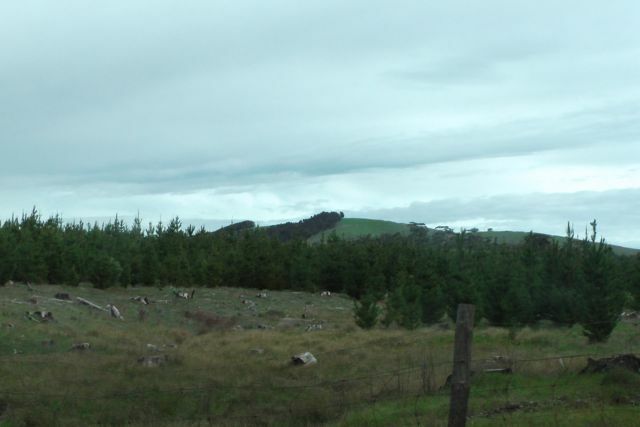 By 1876, Bundaleer had been chosen as the site for the first trial plantings of commercial forestry trees from Europe, North America and all over Australia. It was soon discovered the Californian radiata pine was the best species suited to forestry in Australia and this species went on to become the mainstay of not only Australian forestry, but also forestry in Chile, New Zealand and South Africa. The Woods and Forests Department (now Forestry SA) was formed in 1882 and the Bundaleer Forest Reserve was established with the planting of 400 ha (1000 acres) of forest. 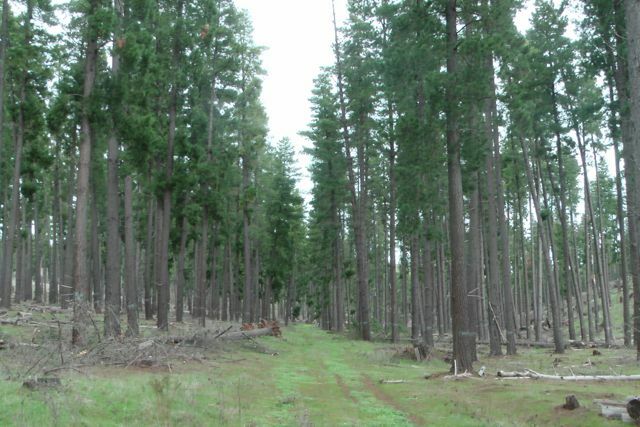 Bundaleer’s timber became known for its high grade, a result of its slow growth (radiata plantations in SA’s South-East grow three times as fast). Throughout its history, Bundaleer timbers has been used for housing and structural timbers, furniture, packaging and shipping, ply-board manufacture, and for the pallet market. Milling of much of the timber occurs locally and is a vital industry to the town and region today. 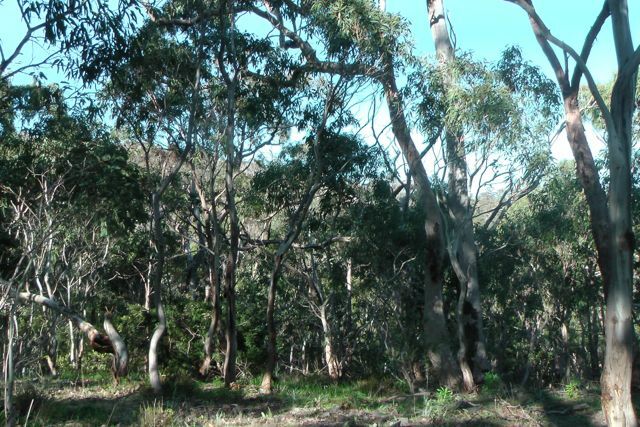 Today, Bundaleer is the state’s smallest forest with about 1,500 hectares of plantations. Ian and I travelled north on RM Williams Way and then turned left onto Bundaleer Gardens Road. We parked the car at the locked gate on Neindorf Road. The gate has a sign on it “Gate: BG 5″. There is also a sign saying ‘Bore Track”. We then commenced our 4km walk from there to the summit. The first section of the walk is along a nicely graded dirt access road to the forest (called Bore Track). There is virtually no incline on the road, but there is worse to come. 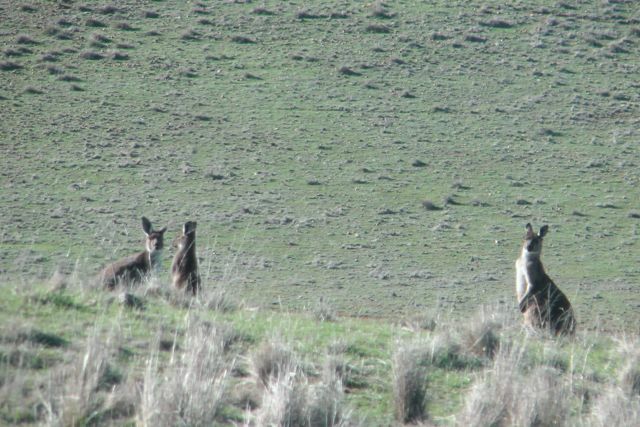 As Ian and I strolled along the road, we saw a few wild deer and a large number of kangaroos and euros. We even saw a cheeky fox which bounded off in a hurry when he heard our approaching voices. The track takes you passed a few small pine plantations and some native scrub, with some great views back to the east of the Hallett wind farms. You then enter the mature pine forest. We took a track through the forest up towards the summit. It was certainly very wet underfoot as we had received plenty of rain the previous weekend. In fact this area was covered in snow last weekend. I enjoyed a beautiful walk through the forest, but Ian had warned me that the hard part of the walk was about to start. 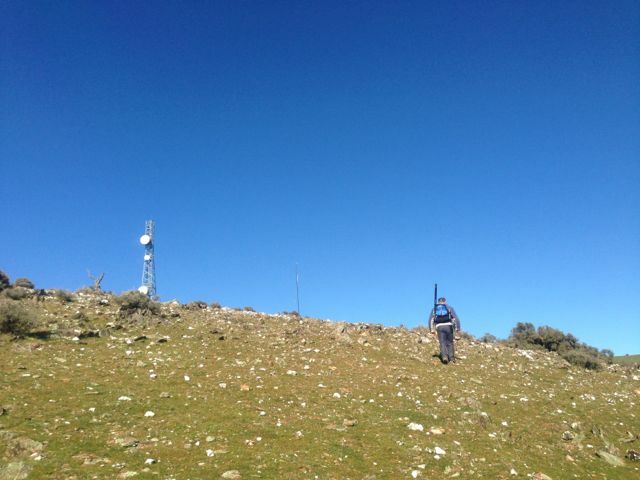 We exited the forest and could see a cleared area and the summit with the tower on the top. This part of the walk rises over vertical 150 metres in under 500 metres. So we commenced the walk which is a real calf burner, with a few rests along the way. The area is very rocky so you need to be a bit careful underfoot. But the climb is well worth it, as the views become increasingly more spectaular as you rise in elevation. 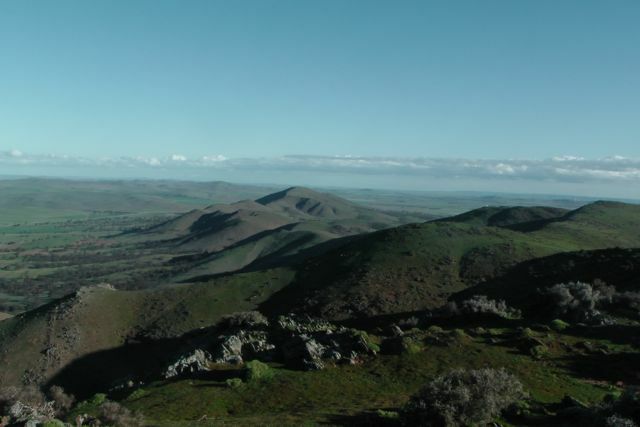 Mount Remarkable and Mount Brown in the Flinders Ranges were visible to the north west. Once we reached the top I was a bit surprised to see that the wind was coming in from the north east, and not from the west. The wind was quite strong, so we set up behind a dry stone wall which runs north-south at the top. Local legend has it that these stone walls were made by Italian inturnees during World War Two. We attached the squid pole to a wire fenceline which runs parallel to the wall, using a couple of octopus straps. And then ran the coax through a gap in the rocks to the western side of the wall. The area is heavily covered in moss rocks. There is a trig point at the summit, just to the south of the tower. 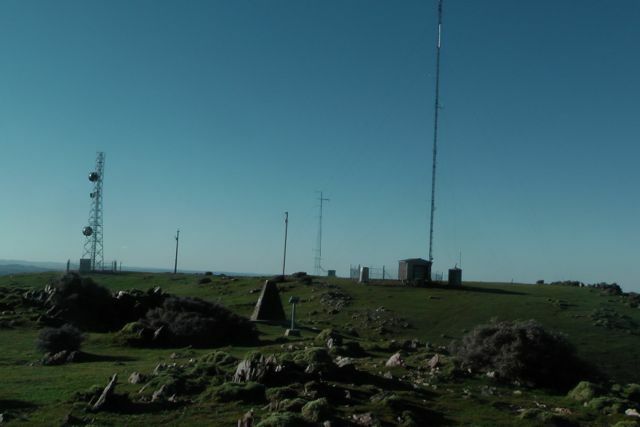 The actual trig station has collapsed and has lies on its side, slowly rusting away, about 5 metres away from the trig point which is a concrete column with a plaque on the top. 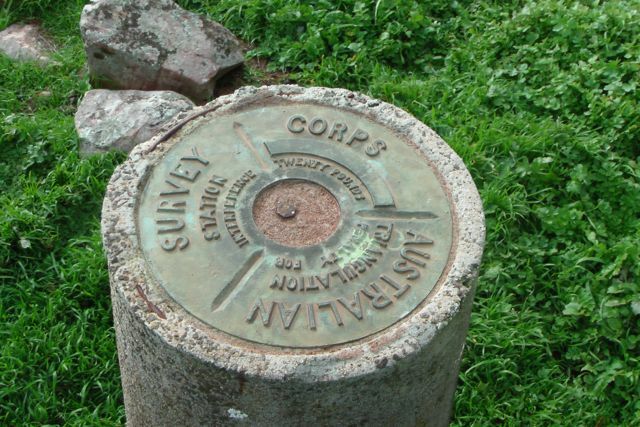 The plaque on the trig point shows that it was erected by the Royal Australian Survey Corps, and there is the warning of a twenty pound fine for interference with the trig. There is also a 4 stage guyed tower at the summit which doesn’t look to be in terrific condition. The top sections have a bit of a lean. There appears to be some sort of small VHF/UHF antenna on the top of the tower. In any event it caused no interference and the noise floor was virtually non existant. The views from the summit are quite spectacular in all directions. 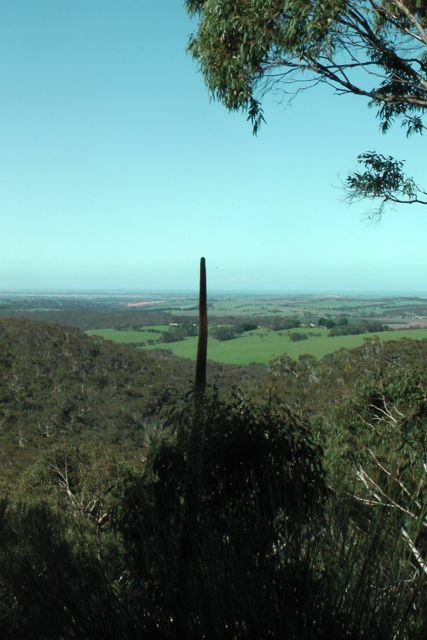 This includes great view of the Bundaleer Forest that was unfortunately devasted by a large bushfire in January 2013. My first contact of the morning was with Col VK5HCF who was QRP with just 5 watts. Larry VK5LY then called in and this was followed by an interesting contact with Marshall VK3MRG who was bicycle mobile in Kew. My fourth contact was with Peter VK3FPSR. This was followed by many of the regular Chasers. My last contact before stretching the legs and Ian taking over, was with Peter VK3ZPF who was portable on Sugerload Peak, VK3/ VN-011. So I was very happy to put another Summit to Summit in the log. I then took a walk through the forest and up along the stone wall, while Ian jumped onto the radio. After about a half hour walk I came back and worked a few more stations on 40m including Brooke VK4RZ and also John VK5BJE who was portable in the Danggali Conservation Park, as part of the VK5 National and Conservation Parks Award. Ian and I decided to have a quick listen on 20m. I had a good QSO with my mate Jesse VK6JES on 20m SSB and this was followed by a contact with Jordi, EA3PT. Ian and I then packed up and took a different route back to the car. The hill was full of Kangaroos and Euros who were quite inquisitive. All in all, another very enjoyable afternoon on a summit. I managed a total of 27 QSO’s on 40m SSB, and 2 QSO’s on 20m SSB. I worked the following stations on 40m SSB:- Col VK5HCF/qrp; Larry VK5LY’ Marshall VK3MRG/bicycle mobile; Peter VK3FPSR; Nev VK5WG; Ian VK3TB/p; Ian VK3OHM; Warren VK3BYD; Brian VK5FMID; Rhett VK3GHZ; Allen VK3HRA; Nick VK3ANL; Matt VK1MA; Ian VK3TCX; Ernie VK3DET; Peter Vk5NAQ; Peter VK3ZPF/p (SOTA); Mal VK3AZZ; Ron VK3JP; Andrew VK2ONZ/qrp; Terry VK5ATN; Paul VK5FUZZ; Brooke VK4RZ; Bill VK3LY; Graham VK5KGP; and John VK5BJE/p. I worked the following stations on 20m SSB:- Jesse VK6JES; and Jordi EA3PT. I have posted a video of the activation on You Tube. 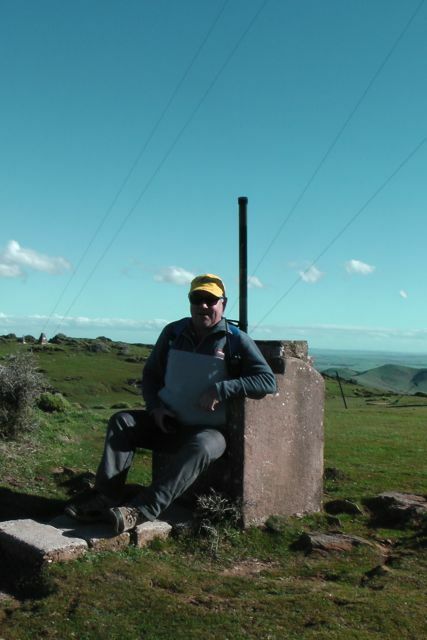 During the week I had planned a 4 summit – weekend activation with Ian VK5CZ. 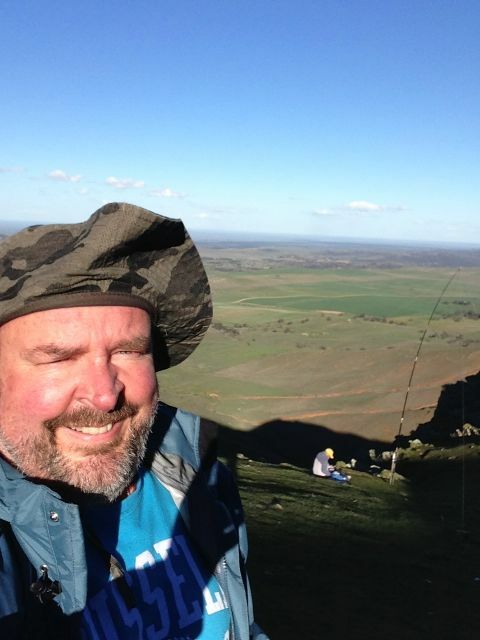 The 4 summits were all located in the mid north of South Australia, about 200 kms – 250 kms north of my home. Ian lived a little closer in beautiful Clare, a great wine growing region, so I decide to stay with Ian and his wife Halima for 2 nights over the weekend. The 4 summits would push me into the 90 point bracket as an activator. So Friday afternoon after my 2 park activations at Mt Magnificent Conservation Park and Finniss Conservation Park, I packed up my gear and headed north to Clare. I travelled up Main North Road through the wine growing towns of Auburn, Leasingham, Watervale, Penwortham, Sevenhill and arrived at Ian’s place at Clare, late afternoon. I enjoyed a good meal at Ian and Halima’s, and a quiet night playing on the radio and having a chat. Ian and I got up nice and early on the Saturday morning at about 5.30 a.m. and enjoyed a cooked breakfast of bacon and eggs and then loaded the car and headed north to our first activation, Hallett Hill, VK5/ SE-003. We travelled along the Clare-Farrell Flat Road to Burra, and then north on the Barrier Highway to the little town of Mount Bryan. The sunrise was spectacular, despite the temperature being very nippy. 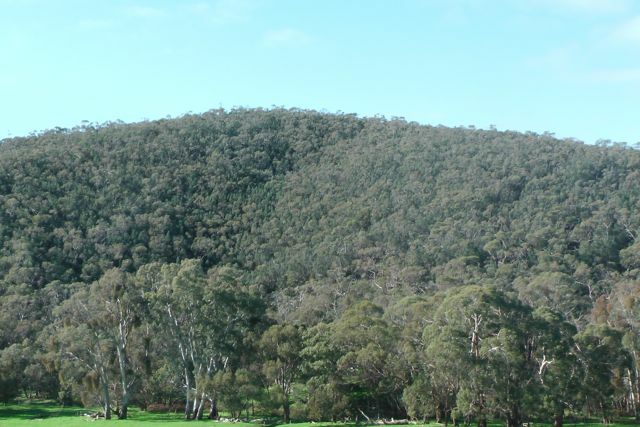 Mount Bryan which is located at the northern end of the Mount Lofty Ranges, was named after the nearby peak, Mount Bryan, which was discovered in December 1839 by Governor George Gawler. He named it in honour of Henry Bryan, a young man who became lost and perished of thirst during Gawler’s expedition. 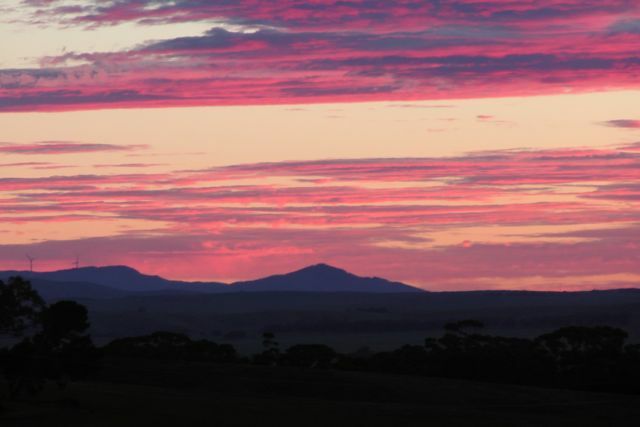 Mount Bryan was once the heart of a thriving farming community, including some of Australia’s best known Merino sheep studs. Today it has a population of about 130 people, with the most prominent building being the old pub, the Mount Bryan Hotel. 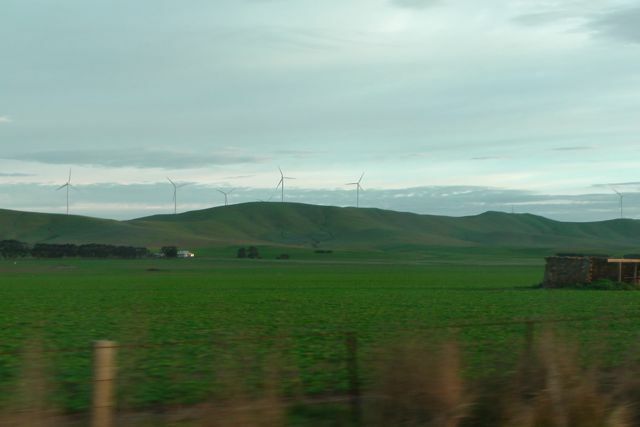 After leaving Mount Bryan, and travelling north along the Barrier Highway, we could clearly see the two towers on the top of Hallett Hill, amongst the wind farm. Hallett Hill is 758 metres above sea level and is worth 4 points. 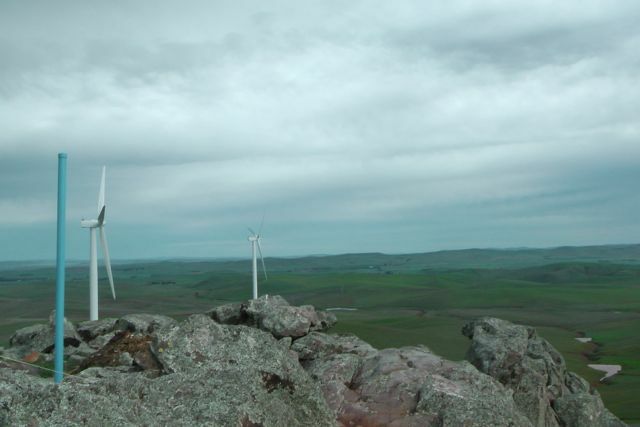 It is situated in the Hallett Range amongst a wind farm, about 5 kms north west of Mount Bryan. The wind farm which is one of five in the area, is referred to as Hallett 2 Wind Farm, and is also known as Hallett Hill Wind Farm. It was completed in late 2009 and consists of 34 Suzlon turbines each 2.1 MW, giving an installed capacity of 71.4 MW. It produces enough energy to power about 40,000 homes. 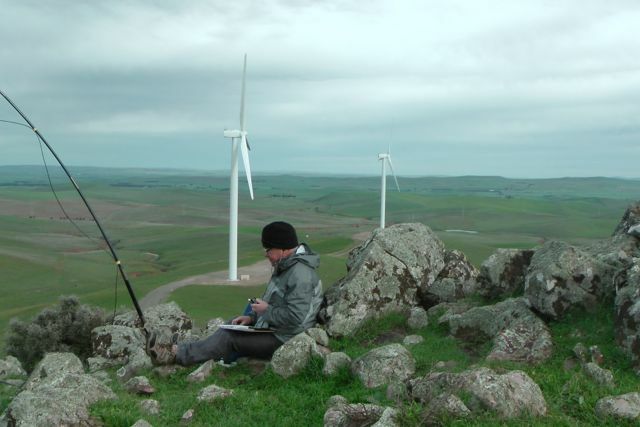 In December 2010, AGL Energy Limited identified that under certain wind conditions tones from the wind turbines were audible at the nearest residence. 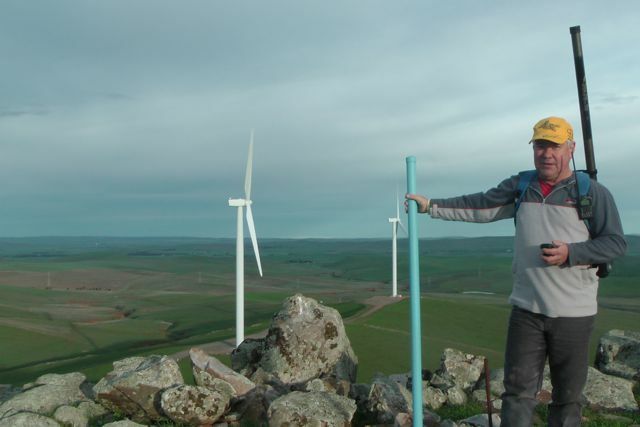 Resonance dampers have since been installed to address this tonality issue with the wind turbines. Noise testing has confirmed that this permanent acoustic treatment has fixed the tonality issue. The summit is located on private property owned by Bill Gebhardt. Bill is a very friendly fella, and allowed us access. Please contact him prior to entering onto his land. I have placed his contact details on the SOTA site. To gain access to the summit, travel through Mount Bryan on the Barrier Highway, and then turn left onto Petherton Road, about 3 kms north of the town. Travel up Petherton Road heading west, and on your left you will see an unlocked entrance gate to the windfarm. Please shut the gates as you find them, as there are sheep grazing & lambing on the property. Ian and I drove along the dirt access road which was in very good condition and parked the car down hill from the summit, and then walked about 1 km up to the actual summit. The weather was atrocious on the top of the range. It was extremely cold (probably below 0 degrees C – wind chill) and the wind was vicious (most likely over 60 kph). Ian and I both agreed this was the windiest and coldest summit we had activated. We got to the top of the summit and I set up at what was left of the trig point, just 3 blue painted metal poles amongst a pile of rocks, which afforded a little bit of shelter from the unrelenting wind which was absolutely belting in from the west. Ian set up close by, also sheltering behind some rocks. I used one of the blue upright poles to secure the squid pole. This was the first time I had to use 3 octopus straps to secure the squid pole in place. I operated first and put a call out on 7.090 on 40m SSB. The first cab off the rank for the day was Nev VK5WG who had a ‘cracking’ signal as always. I then spoke with Tony VK3CAT who was operating QRP with just 5 watts. Tony had a beautiful 5/8 signal. Half way through my third QSO with Warren VK3BYD, I heard a terrible cracking sound coming from behind me and ended up with my squid pole on top of me. Unfortunately it had completely snapped off in the wind ! Lesson learnt……if you are going to secure your squid pole to a solid metal object such as a pole in very windy conditions, try to secure the squid pole on the opposite side from where the wind is coming. After looking at my squid pole secured to the metal pole, it appeared to Ian and I that it had no flexibility and it snapped off at the weakest point, at the top of the metal pole in the very severe wind. So Ian and I tried to put it together as best we could but it didn’t last long, as the wind was so severe that the squid pole snapped again. Again it was pulled down and resecured to the pole, and luckily it lasted me for the duration of the activation. But it certainly had seen better days and wasn’t going to be accompanying me on any more SOTA trips. Another one is on order from Haverfords in NSW. I had some good QRP contacts whilst on top of the hill. As mentioned Tony VK3CAT using just 5 watts had a good strong 5/8 signal. I also worked Ian VK3FD who was QRP with a great signal, Andrew VK2ONZ, and Andrew VK4DNA who was QRP with just 5 watts (5/2 signal but perfectly readable). I would encourage more people to try QRP out of interest as ‘Chasers’, because as Andrew VK1NAM has pointed out previously, on the top of most of these summits the noise floor is non existant. So if you can hear me, I will more likely than not be able to hear you quite well. It is always a thrill to work QRP to QRP. 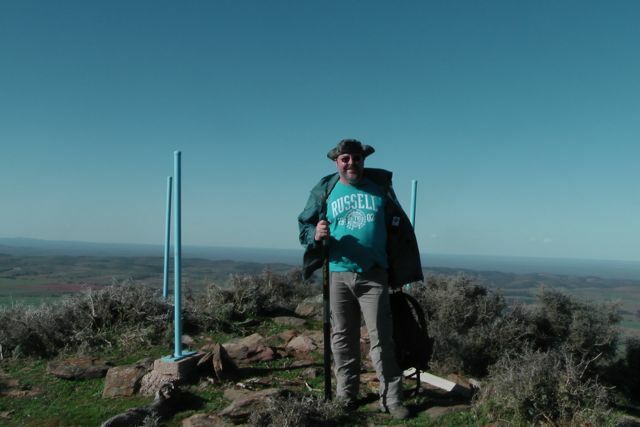 I also managed one Summit to Summit QSO with Mike, VK3XL/p, who was operating from VK3/ VG-099. Mike was 5/5 and I received 5/9 back from Mike. I ended up with a total of 27 QSO’s on 40m SSB into VK1, VK3, VK4, & VK5. 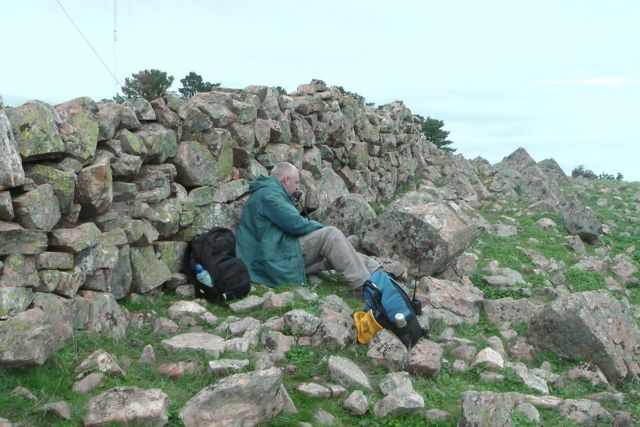 Ian then took over after the UTC roll over and had a further 14 QSO’s, whilst I went for a walk and explored the hill. There are terrific views from the top in all directions. I find it amazing that every hill is different, with varied challenges and views. I think that for me is one of the attractions of SOTA. 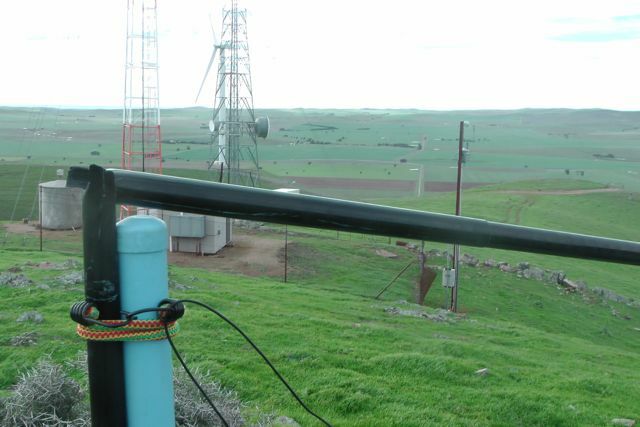 I worked the following stations:- Nev VK5WG; Tony VK3CAT/qrp; Warren VK3BYD; Ron VK3AFW; Mal VK3AZZ; Max VK3MCX; Peter VK3FPSR; Tom VK5EE; Brian VK3MCD; Rhett VK3GHZ; Nick VK3ANL; Glenn VK3YY; Bernard VK3AMB; Allen VK3HRA; Col VK5HCF; Ian VK3FD/qrp; Andrew VK2ONZ; Andrew VK4DNA; Ian VK3TCX/m; Ed VK2JI; Ernie VK3DET; Rob VK2FROB; Leon VK3VGA; Brian VK5FMID; Al V1RX; Ian VK3TB/p; and Mike VK3XL /p (SOTA). Time to pack up and head off this freezing blowy hill, and on to the next summit….New Campbell Hill VK5/ SE-007, about an hour’s drive away to the north west. I have posted a You Tube video of the activation of Hallett Hill. My second park of the day was the Finniss Conservation Park which is just a hop, skip and a jump from the Mt Magnificent Conservation Park. It is only about 3 kms away, on the southern side of the Mt Magnificent Road. Access to the park is via a wooden gate on the southern side of the Mt Magnificent Road. 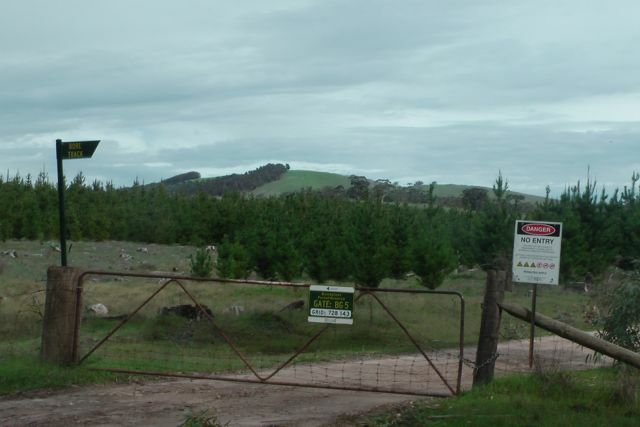 There is a Heysen trail sign on the fence, which is alongside an old stone homestead. 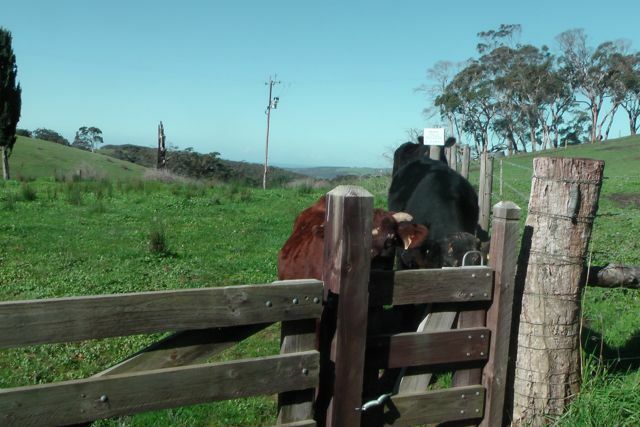 I parked the car at the gate, and walked through the paddocks, where there were cattle grazing. It was about a 3 km walk from there to get to the park. Under foot it was very wet, particularly in the paddocks, but a trail starts at the 2nd gate, which is a bit more pleasing to walk on. 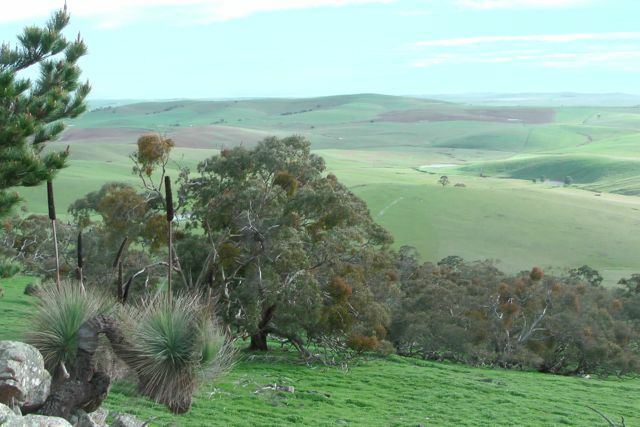 The Finniss Conservation Park is a small park of 108 hectares situated on the Fleurieu Peninsula, about 64 kms south of Adelaide. 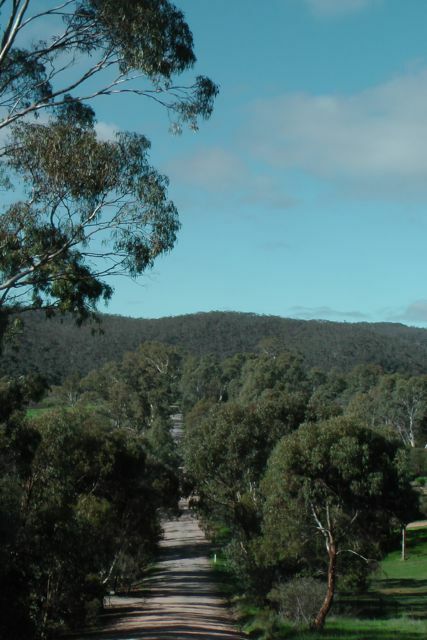 The park was established in 1976 and offers views over the Finniss River and the surrounding landscape. 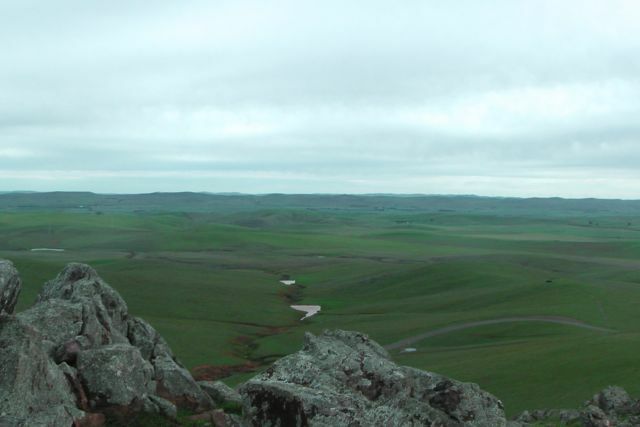 There is a high rocky plateau on the western side of the park which offers views over the Finniss Valley. The scrub within the park is extremely thick. The Finniss River, which is about 50 kms in length, flows through the park. The Finniss commences nearby at Yundi and flows into the Lower Lakes at Goolwa. There are very panoramic views of the Fleurieu Peninsula, down to Victor Harbor, Goolwa, and Hindmarsh Island. I set up my 7 m squid pole and the 40m dipole. I used some large moss rocks to hold the squid pole up, and there was no shortage of options of trees to secure the ends of the dipole. I used a tree stump as a back rest and tuned the radio to 40m. My first contact was with John VK5BJE who was portable in the Pikes River CP. I was also lucky enough to speak with Hans VK5YX who was portable in Queensland with his wife Lesley VK5LOL, at Coopers Creek Crossing. Hans was using the mobile whip on his car and had a great 5/5 signal. And to my surprise with my 5 watts and little dipole I received 5/5 back from Hans. I also spoke with Larry VK5LY who was operating portable in the Morgan Conservation Park (5/9 both ways). Within 45 minutes I had accrued 14 QSO’s and I was ready to pack up and head home. 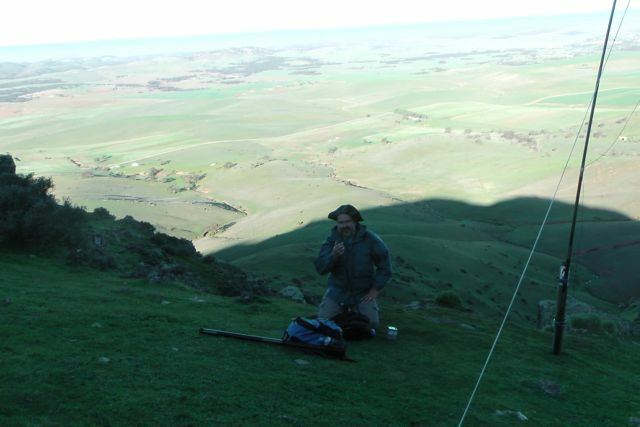 I needed to go and have some lunch and then head up to Clare to stay with Ian VK5CZ, and activate 4 SOTA peaks over the weekend. The following stations were worked:- John VK5BJE/p; Andy VK5LA; Ian VK5HS/m; Hans VK5YX/4; Brian VK5FMID; Larry VK5LY/p; Trevor Vk5ATW; Nev VK5WG; Nick VK3ANL; Tom VK5EE; Bernard VK3AMB; Mal VK3AZZ; Peter VK5NAQ; and Charles VK5FBAC. 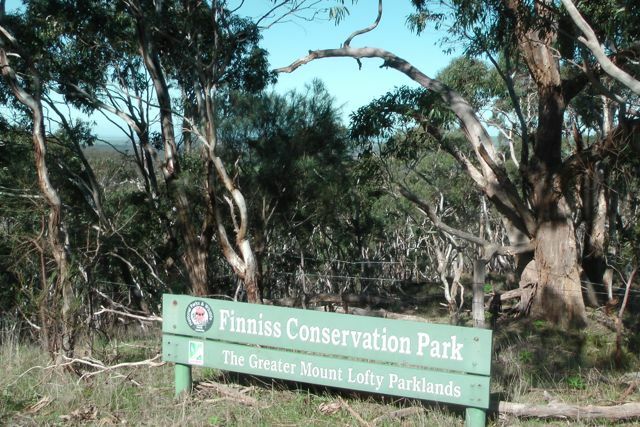 Finniss Conservation Park is a beautiful park and is well worth a visit. Unless you did some homework on the internet, most people wouldn’t even know the park was there. On Friday morning, 26th July 2013, I headed south from home with the intention to activate another 2 parks as part of the VK5 National & Conservation Parks Award. 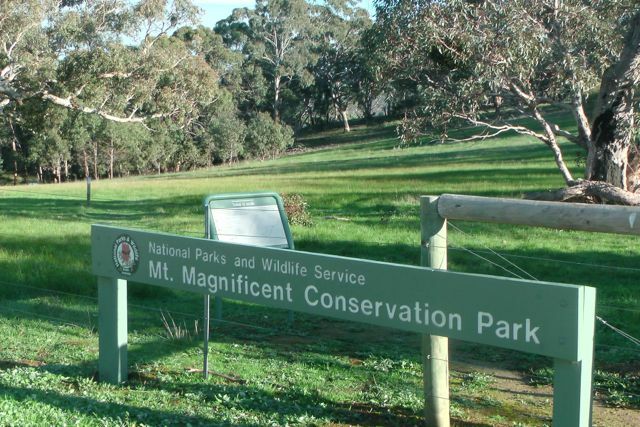 My first park was the Mount Magnificent Conservation Park, which is located on the Fleurieu Peninsula, about 60 kms south of Adelaide. The park is about 90 hectares in size and was established 1972. It preserves an area of remnant bushland. The major feature of the park is the 380 metre high Mount Magnificent summit. 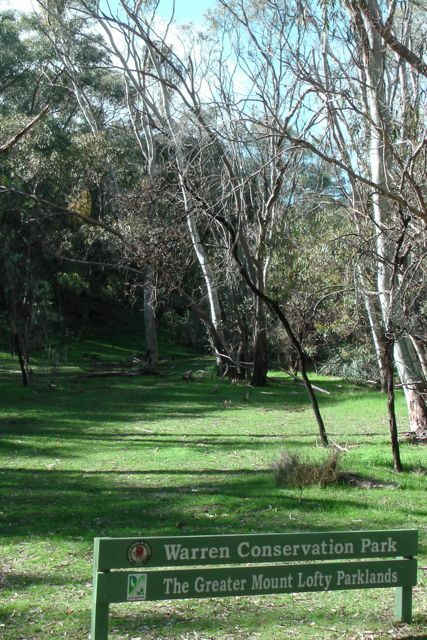 The Heysen Trail passes through this park which is situated on the eastern slopes of the Mount Lofty Ranges. A spur trail through forest takes you to the Mount Magnificent trig point, where you will be graced with spectacular views of the surrounding countryside. The Heysen trail links this park with the Finniss Conservation Park to the east 9my next activation), and the Kyeema Conservation Park to the northwest (which I have previously activated). 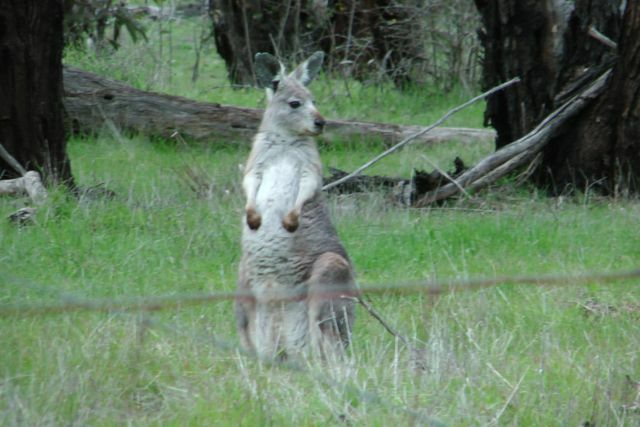 There is plenty of wildlife to be found in the park including a large number of Western Grey kangaroos, and echidnas. There is also a large number of bird varieties. 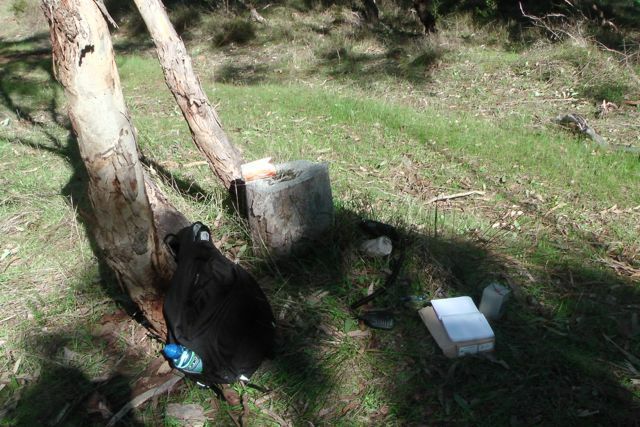 I parked my car on Mt Magnificent Road, and then walked about 2 kms down the Heysen trail, where I found a large fallen tree, which looked just perfect to use as a chair & desk. 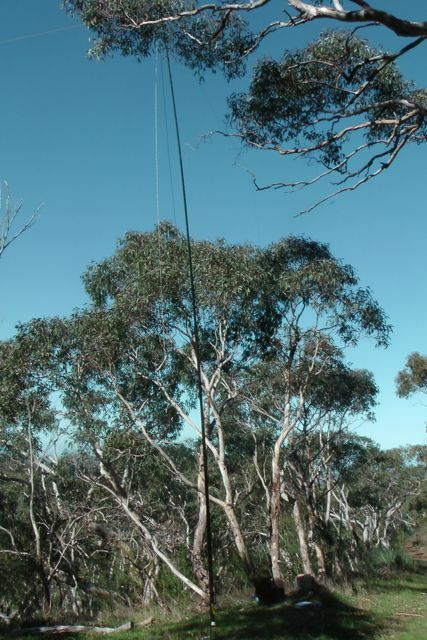 So I set up the 40m dipole on the 7m squid pole, using some gum trees to tie off the ends, and tuned the radio to 7.100 and heard Larry VK5LY who was portable in the Pooginook Conservation Park up in the Riverland. I called Larry who had a great 5/8 signal and I received 5/9 back from him. This was a good start to get a Park to Park contact. I then moved down the band a bit and heard John VK5BJE on 7.095, who was also operating portable from a park. John was also an excellent 5/8 signal from the Pikes River Conservation Park. My second Park to Park contact for the day, which I was really happy with. I enjoy working QRP to QRP, and again I ahd a few good low power contacts. Bernard VK3AMB who was using just 4 watts was a terrific 5/8 signal. As was Nev VK5WG from Crystal Brook who was 5/9. Rik VK3KAN who was mobile was also QRP 5 watts and was 5/7. I ended up with a total of 17 QSO’s on 40m SSB, which I was really pleased with, considering it was a week day. The following stations were worked:- Larry VK5LY/p; John VK5BJE/p; Tom VK5EE; Ivan VK5HS; Nick VK3ANL; Mal VK3AZZ; Bernard VK3AMB; Brian VK5FMID; Peter VK3PF; Gary VK2DAK; Brian VK3MCD/m; Nev VK5WG; Angus VK2IET; Tony VK3CAT/m; Rik VK3KAN/pedestrian mobile; Tony VK3CTM; and Trevor VK5ATW. My fourth and final park of the day was the Warren Conservation Park, located about 60 kms north of Adelaide, and about 5 kms south of Williamstown in the Mount Lofty Ranges. I accessed the park via Watts Gully Road. Warren Conservation Park is 353 hectares in size, and is characterised by steep country with views over forests, reservoirs, pastures and bushland above the spectacular Warren Gorge. The park which was dedicated in 1966, is most colourful in spring when wattles, banksias, hakeas, heaths and eucalypts are in flower, but its native fauna and wild forests of stringybarks and long-leafed box are always worth a visit. And today was no exception. The sun was shining and it was a beautiful afternoon. 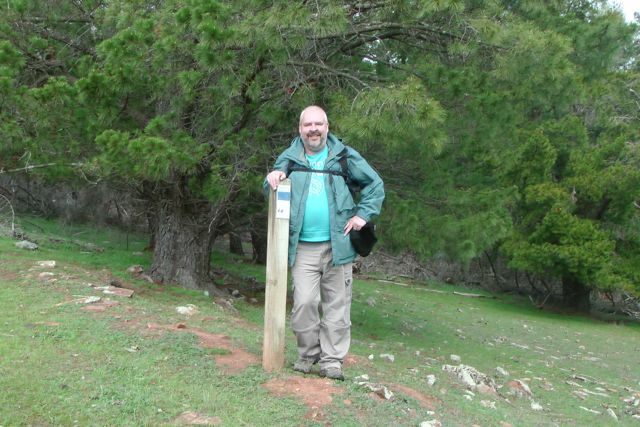 The park has four challenging walking trails, including a section of the long distance Heysen Trail. The tracks are steep and difficult and should be used by experienced bushwalkers only. An excellent walk starts at Watts Gully Road. There is a boardwalk here at the commencement of the walk which bridges a wet area. The relatively untouched nature is a haven for some of Australia’s rarest animals and provides ideal opportunities for naturalists, birdwatchers and photographers. Over 50 species of birs can be found in the park. There is a wide variety of native animals including Western Grey kangaroos, koalas, Southern Brown bandicoots, and echidnas. 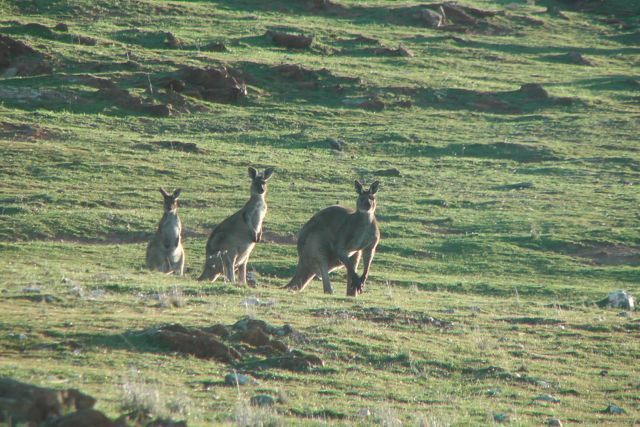 There were certainly plenty of kangaroos who were either sunning themselves or feeding out in some of the open areas on nearby hills. After 40m had slowed down I QSY’d over to 20m. And although it was overly busy, there was still some good signals coming in from Europe. I called quite a few stations but on the majority of occasions I got drowned out by other VK’s & USA stations using a lot more than my measly 5 watts. But I did manage to get through to Slavko S573DX in Slovenia. He was 5/9 and I got a respectable 5/7 back from him. I then spoke with Jason ZL3JAS in Christchurch. I also received a 5/7 signal report from Jason. Next I spoke with Marcos CT1EHO who was booming in. I received a 5/4 signal report from Marcos. My last DX contact of the day was with Theo OT4A. Theo was a strong 5/9 and I received a 5/7 from Teho. Really quite amazing what you can do with just 5 watts and a simple dipole. I ended up with a total of 19 QSO’s on 40m SSB & 20m SSB. The following stations were worked:- Larry VK5LY; Nev VK5WG; Tom VK5EE; Col VK5HCF; Brian VK5FMID; Bernard VK3AMB; Errol VK5FEKH/p; Terry VK3UP; Kevin VK2VKB; Ian VK3FD; Peter VK5ZPG; Doug VK3FJAE; Jim VK2FADV; Paul VK7CC; Don VK5NFB; Slavko S573DX; Jason ZL3JAS; Marcos CT1EHI; and Theo OT4A. This was the end of a very enjoyable day.